Since August, the State Department of Education has flagged 46 percent of all Idaho public schools as needing improvement. All told, 336 of Idaho’s 725 public schools and charters have been identified for improvement under the state’s new accountability system, which was mandated by the federal Every Student Succeeds Act. (Click the interactive map at the top of this article to find out if your school was flagged for improvement and why). The effort is part of a massive new commitment to data and accountability, and schools were flagged as needing improvement in one of four reports the SDE has issued since the summer. In its latest batch of reports, the SDE flagged 67 schools as needing Additional Targeted Support and Improvement due to low performance among student subgroups. Thirty-six of those schools had not been previously identified for improvement, while 31 were flagged under previous accountability reports. For the ATSI list, the state used the same methodology and indicators as it did to calculate the lowest performing schools list in the falls. This time, however, the state looked at the performance of student subgroups, such as English language learners or economically disadvantaged students, rather than a school’s entire student body. Indicators included proficiency and growth on state standardized tests, four-year high school graduation rates and college and career readiness indicators. The 67 schools on the ATSI list need to complete an improvement plan, which must be submitted to their school board or administration. Schools on the list are not eligible to apply for additional school improvement funding and are not required to submit their plans to the state, Laraway and SDE spokeswoman Kris Rodine said. Schools aren’t required to post their improvement plans on their websites, but may choose to do so, Rodine said. There is also no deadline for superintendents to submit assurance forms attesting to the fact that the school finalized its improvement plan. What are the classes of identification? Each of the 336 schools identified for improvement appeared on at least one of four lists. Comprehensive Support and Improvement: These are the lowest-performing schools in the state. They were identified because student performance on the state’s four academic indicators and a school quality metric ranked among the bottom 5 percent in the state. Comprehensive Support and Improvement Graduation Rate Schools: These schools were all flagged because the three-year average high school graduation rate was below 66.7 percent. Targeted Support and Improvement: These schools were selected based on performance of student subgroups. If a subgroup of at least 20 students consistently underperformed their peers as a whole with a performance gap of at least 35 percent over three consecutive years, a school made the list. More schools were flagged for improvement on this list than any other, with 247 schools making the list. Additional Targeted Support and Improvement: This latest list also dealt with performance of student subgroups. If the performance of student subgroups alone would have caused a school to make the lowest performing schools list (the CSI list), schools would end up on this list. Why were so many schools flagged? In simple terms, schools were flagged because they met the criteria outlined under Idaho’s ESSA plan. SDE officials know that with identifying so many schools, there is a risk of data fatigue. “You have to find a sweet spot of what is meaningful identification, versus not over identifying too much as to make it meaningless,” said Laraway. In some regards, the SDE data dumps could be even more confusing to the casual observer. Some schools were identified as top performing schools in the summer based on student performance in the 90th percentile among all schools on one of several academic indicators. That sounds like something to really celebrate, right? An elite school, a high-flyer, right? Except some of those same schools were flagged for improvement on subsequent lists. The devil is in the details, of course. While one school could be a top performing school in math, the same school may have student subgroups who really struggle in English. That’s why schools wound up on both the top-performing and improvement lists. Laraway said that’s the point of the lists. 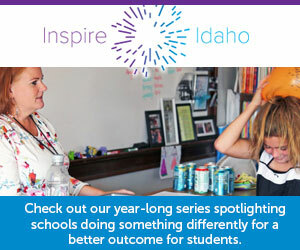 The state wants to celebrate success and shine a light on best practices. At the same time, the state wants to use data to pinpoint areas of weakness, areas where schools could target their improvement plans or resources. Schools are dynamic, and could excel in one or more areas, but also have weaknesses or performance gaps that need to be closed. “That’s the responsibility we have in our accountability system to be transparent with what we identify,” Laraway said. Coming in December, the SDE will release new school data report cards that will combine many of these data elements in a single report and offer charts, graphs and other data visualization tools that are designed to help parents and taxpayers understand what is being reported. The target data for a soft launch of the report cards is set for Dec. 17, with additional resources set to come online in January, Laraway said.